Lindsay is a passionate advocate of the complimenting disciplines of Pilates and yoga. Her classes combine the focus, breath and mindset of yoga while maintaining the detail of Pilates instruction. She is dedicated to sharing the joy, challenges and rewards of deep conscious movement with her students. Lindsay is a certified Balanced Body Pilates instructor and completed her 500hr Yoga Teacher Training in 2010. Lindsay recently took over ownership of Om Studios in 2016 and has loved being apart of this special community in Monterey Bay. Michael began practicing yoga in 2003 and developed a deep connection to the practice. She completed her first Yoga Teacher Training in the Vinyasa Flow style of yoga in 2008. Since her initial certification, Michael has continued her yoga studies through numerous workshops and additional teacher trainings and continues to be inspired by her many teachers. Michael's yoga classes are a blend of the many styles she has studied. She places an emphasis on knowing and honoring one's own limitations, while at the same time encouraging growth through mindfulness and balanced effort. "Yoga is not about a destination, but a journey. Along the way we meet obstacles but we continue to strive to reveal our own inner light through a deep connection to our true selves." Kiara’s classes are known for their alignment principles, hands-on adjustments, encouraging guidance and fun playlists. In each class, Kiara will challenge your edge, offering modifications and variations that are right for each practitioner. Teaching yoga since 2011, Kiara has taught classes in the yoga studio and gyms, at resorts, in corporate offices, juvenile centers and country clubs. She has taught to at-risk youth, celebrities, varying kinds of athletes, individual’s suffering with physical and psychological illness and to advanced and beginning yogis. Kiara co-created Satyam 200hr Yoga Teacher Training in 2016 and is one of the main instructors of the program. Currently, Kiara is working on curriculum for a 300hr Yoga Teacher Training “Becoming a master teacher &amp; mastering the business of yoga” set to launch in January 2020. Recognized by lululemon athletica as an exceptional yoga instructor, she has been a lulu ambassador since March of 2016. Kiara’s personal practice spans nearly twenty years and in that time she has learned from innumerable teachers. However, it was in her years working for Yoga Journal magazine that she holds most dear; her time on the Yoga Journal Events team afforded her the ability to practice and learn from all the world-renowned yoga instructors. Having multiple influencers, Kiara teaches a unique style of yoga she now dubs Ki Yoga. Informed beyond her time on the mat, Kiara brings into her classes knowledge of Thai Massage, Aromatherapy, Reiki, Hypnotherapy and functional anatomy. She shares this eclectic knowledge with her public classes, in workshops, with private clientele and in yoga teacher trainings. Gennica Cochran 500 HR EYT, began teaching yoga after attending Mount Madonna School of Yoga in 2010, where she was inspired by the teachings of Baba Har Dass to live a life dedicated to service, compassion, and grace. She has completed training in Restorative, Pre-Natal, Classical Ashtanga (Raja) Yoga, and received her 300HR Advanced certification with Jason Crandell in 2016. Gennica’s classes encourage students to explore their practice with intention, focus and humility by combining breath awareness and skillful movement while also drawing on her love of the earth and cosmos. Each class features threads of inspiration cultivated by the wisdom of the seasons and cycles of the moon, creating a greater understanding of the truth of who we are: powerful, connected, intuitive beings. For more information, visit cosmictoro.com. Paulina is a 200 HR RYT who began teaching yoga in 2016 in Santa Barbara. While she has studied with various teachers, her greatest influences are Ryan & Stephanie Besler. Since the moment she first stepped on a mat she knew her journey into yoga would be a life-long practice and she considers herself to always be a student of yoga. Her classes infuse strength, foundation and are rooted in philosophy. Paulina will be in service to help you connect to the physical strength and playful nature of the asana practice, coupled with learning the deep roots of the language and philosophy of the practice to ultimately tap into your center - your true nature, your joy. Courtney Grimes is a lifelong fitness enthusiast. Her first love is running, but she discovered Barre in 2011 while living in Southern California, and found it to be the perfect compliment to cardio workouts, as well as transformative for muscle toning and strengthening. After practicing barre as a student, Courtney decided to share her passion for the workout with others and became a certified instructor through the Pilates Sports Center. Courtney's goal is to provide fun and challenging workouts that will leave clients feeling stronger and more confident! Kelsey Jo is a certified barre instructor from the International Ballet Barre Fitness Association (IBBFA). She makes her were way out to the Monterey Bay from Toledo, Ohio where she found her true passion for fitness and the desire to grow as a person. Kelsey Jo graduated from Florida Gulf Coast University majoring in PGA Golf Management and is currently taking continuing education classes at Stanford to work towards her aspirations of becoming a broadcast journalist. 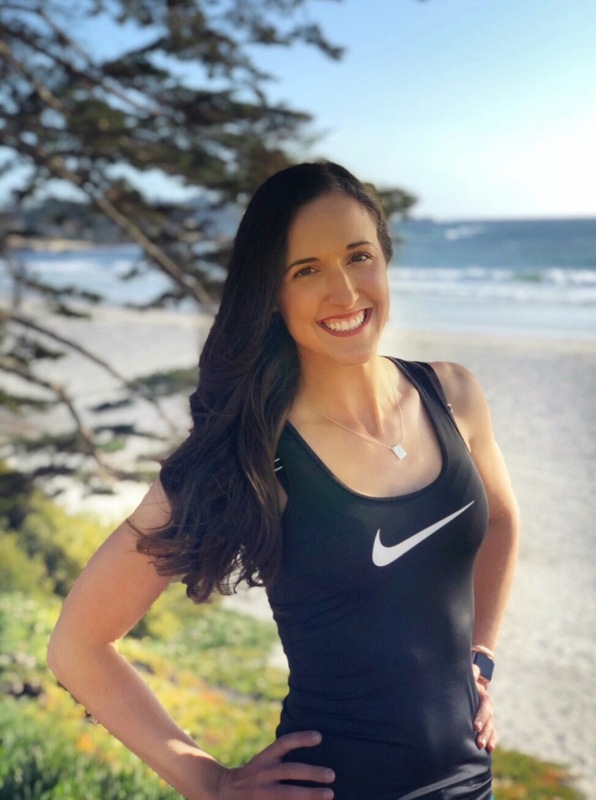 Aside from teaching barre, Kelsey Jo is a PGA Golf Professional at Pebble Beach Golf Links. She is certified in TPI (Titleist Performance Institute) where she measures the physical limitations of the body. Reaching towards the next step and awareness are two major areas of focus of hers. Inside and outside the classroom, she is known for smiling and keeping a positive attitude. You will always find Kelsey Jo going the extra mile and motivating her students to set new limits and goals for themselves. Attend a class and leave feeling inspired, confident and strong! Halle Baltes is a lifelong fitness fanatic who is excited to share her enthusiasm with all! Halle was a competitive soccer player growing up and turned to group fitness as a way to stay motivated with a team-like environment. Halle initially began work at Om Studios as a way to get involved with the community after moving to Monterey with her husband. Her love of barre led her to pursue the International Ballet Barre Fitness Association (I.B.B.F.A.) certification. Halle's classes combine traditional barre techniques with moments of High Intensity Interval Training (H.I.I.T). Her classes are designed to be full-body focused and accessible to every age and fitness level. Halle's objectives for her students include sculpting, conditioning, injury prevention through strength and stabilization, and getting fit in a fun and welcoming environment. Hayley first started yoga as a young teen, pushed to do small group lessons. As she got older and began to pick up the practice on her own she soon realized how healing and beneficial yoga could be. In college she turned to yoga as a tool to help with anxiety. Yoga kept her grounded as she studied to get a BS in Psychology. Through the study of psychology and the practice of yoga Hayley noticed the two complimented one another. She received her 200hr RYT at Om Studios and loves to teach vinyasa flows and yoga sculpt. Hayley sees yoga as a way to help and inspire people to connect with themselves on a deeper level. Kali Rock is a trained Ayurvedic Counselor and yoga instructor RYS-200 from California. She received her training from Om studios of Carmel, Dancing Shiva located in Los Angeles, and is continuing her Ayurvedic education with Mount Madonna Institute - College of Ayurveda. Kali is passionate about spreading and encouraging health via a balanced plant based diet using unprocessed whole organic foods supplemented with Ayurvedic herbs, spices, and vitamins. With this education Kali counsels those who are interested in a healthy diet and lifestyle change to combat illness stress and increase energy and overall wellbeing. Kali also is schooled in the bodies muscular and skeletal system with a driven focus on proper alignment to avoid pain and injury. Kali has been teaching and coaching for the past two years here in Carmel with experience in all styles of yoga asana. Sydney bridges foundational principles of Yoga with a deeper connection to Pranayama breath work intertwined within the physical Asana practice. Sydney is a RYT-200 certified yoga instructor in which she completed her training at the Yandara Institute, certified in open-style yoga with experience teaching Vinyasa, Hatha, Yin, Restorative, Kundalini, Prenatal, and more. Her approach to teaching goes beyond the physical Asana practice and intention is for it to be a tool for students to take into their everyday lives. Within Sydney's classes, she offers natural cues, ignites a sense of grounding, and incorporates powerful breath work that brings a sense of stillness within to quiet the mind and awaken the inner body. With a focus of wellness at the core of the teachings, Sydney relies on the cycle of the seasons, the time of day, and what energy students bring to class. Sydney's classes are a balance of Yang and Yin to ensure a balanced state of mind, body, and spirit when navigating the modern world. When off the mat, Sydney enjoys traveling the world, hiking, gardening, and making raw vegan goodies! For as long as she can remember, Autumn has been dancing. She took her first barre class four years ago to help tone and strengthen her whole body and immediately fell in love. After seeing her body build lean muscles from the small isometric movements, cardio, and strength training, she knew she wanted to share her passion for fitness and dance with others. In 2017, she received her certification to teach barre from the International Ballet Barre Fitness Association (IBBFA) and tailors her classes to be fun and upbeat, with various challenges added in to make sure you feel the burn. Lynn believes that life is loud! It can be easy to miss the messages from within because of all the input and activity in the day. Through over 15 years of practice, Lynn feels yoga teaches students how to get quieter regardless of the volume and chaos around them. Through sharing the yoga practice, she encourages a curious heart and an inquiring mind in her students. Lynn aims to make class inspiring, exhausting, and full of fun. She encourages Svadhyaya (self study) in students to humbly push their daily limits and then reside in contentment. She is known for mixing her thoughtful class sequences, yoga philosophies and eclectic music delivering each class as a one-of-a-kind experience. Lynn blends alignment, anatomy, and energy in her cues so each student can find the shape of the poses that best suits the individual. Through the challenges in class, students can begin to see past their immediate reactions and uncover compassion for the self. Lynn encourages her students to listen to themselves and gracefully ride the ebbs and flow in life with a sense of humor and a light heart. Lynn has been teaching yoga for over 13 years in the Midwest. She loves an eclectic practice balancing the energy of hot, sweaty vinyasa flow with the grounding of a slow, cool yin class. Lynn has had the privilege of training and mentoring yoga teachers for the last 6 years and is honored to co-lead Satyam Teacher Training at Om Oasis. Megan Cassamas has been teaching yoga to adults and children at yoga studios, workplaces, schools, and camps since 2013. She began practicing yoga in college to relieve stress and was hooked ever since. To her, Yoga is not just a practice but more of a way of life. After gaining her 200-hour Yoga Alliance certification, Megan completed specialty training in hot yoga and vinyasa yoga. With a wide range of experience in various styles of yoga, Megan customizes each class to her students' needs and goals, catering to a variety of levels. Incorporating some light-hearted humor, motivating guidance, and a technical focus on postures she creates balanced, yet challenging, classes that encourage students to trust and explore the strength and flexibility of their body. Her passion for bringing wellness to others has deepended since teaching yoga to children and mothers like herself. She hosts speciality classes in prenatal and postpartum yoga where she can offer her knowledge and experience as a doula. She currently teaches grades K-12 around the Monterey peninsula and hosts her Moja Yoga Kids camps over the summer. Teaching at Om since 2015, Megan considers it her home studio. Above all else, Megan strives to make sure that her students feel comfortable and acknowledged. “I aim to connect students to their inner world. I believe the strengthening of what we cannot see leads to the connection we most desire." Krystal Barschig is a certified yoga instructor who guides students through thoughtful classes that support a practical, “real-life” integration of mind, body, and soul. Her teaching inspires free breathing, intuitive movement, and conscious living. She weaves yogic principles and spiritual teachings into a deeply physical practice, with the intention of inspiring the remembrance of wholeness, alignment with the true Self, trust in one’s innate wisdom, and fulfillment of one’s unique purpose.